The Aquascape Automatic Water fill Valve Kit allows you to easily maintain a constant water level or automatically top off water after a water change. The Aquascape Compact Automatic Water fill Valve Kit allows you to easily maintain a constant water level or automatically top off water after a water change. The automatic float valve comes complete with a half inch hose barb adapter, as well as an adapter that easily hooks to most three-quarter inch standard garden hoses. Adding Water slowly as it evaporates reduces chances of dramatically changing water chemistry and temperature. 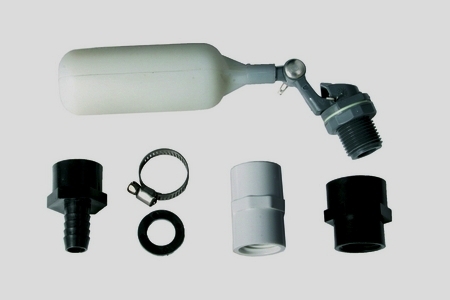 Includes fittings to connect to a standard garden hose, 1/4" poly-pipe, 1/2" poly pipe/ 1/2" PVC pipe. Ideal for use in ponds, aquariums, pools and large fountains. To View the PDF Instruction Sheet "Click Here"
From bikeath1337 of Water Mill, New York on 5/6/2016 . From Chad Roland of Marion, Illinois on 8/13/2013 . 6/11/2014 – Do you sell float only for compact waterfill valve? If so, please provide me the price for the float.